It was always good for a titter or two and made Ami Richards about the most popular fellow in town. It also made him something of a bon ami. He fattened in the glory but never staled. As he proved when time came to name the town in the 1840s and everybody said let Ami do it. Ami looked no further than the Bible and came up with Ai, the name of a wicked town destroyed by righteous Joshua. And this sleepy little community in Fulton County has been a 2-vowel town ever since old Ami Richards decided to really perpetuate his humor. Oldtimers prefer that explanation for the naming of the town. They laugh off the tale that it came out Ai simply because old Ami was too deep in his cups to make an “m” the day he took quill in shaky fingers to record his choice of names. Anyway they look at it, Ami was quite a card. And he did name this place. Everybody’s eager to get that out to offset recent stories considered any thing but flattered by natives. Toledoans can reach Ai (say it as it’s spelled) by driving almost 25 miles out Dorr St. and State Rt. 246. 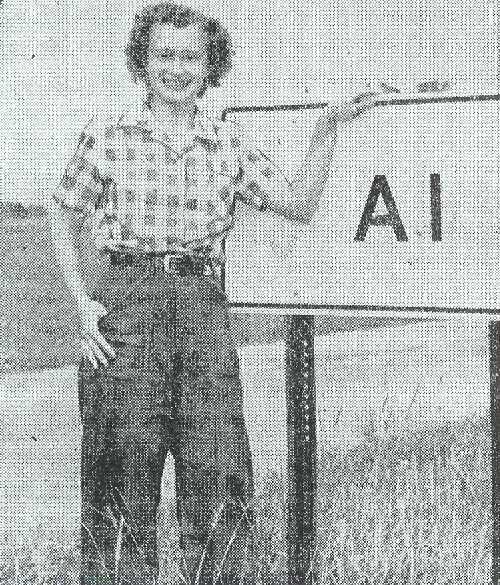 A standard road sign tells you when you enter Ai. The Main Street is Rt. 246 and it stretches 1,876 feet from the Ai sign on the east to a similar one on the west. Between the signs are 12 houses, a sprawling barn, an abandoned grain elevator, two general stores, a church and a cemetery. The rest of Ai extends south for several feet on Delta Rd. Located on Delta Rd.’s leg of Ai are a few more homes, the town hall and Fulton Township’s Centralized School, which has been educating youngsters from the first grade through high school. That’s AI, physically. The part of town that’s seen by visitors and the curious who drive here to see a community with such an odd name. The town isn’t situated in the wilderness and isn’t peopled by lost souls. Civic-minded residents like Mrs. Harley Turpening and Mrs. Herbert Garsey get ready to chase you out with their brooms if you even hint at such thoughts. They point with pride to the modern school building constructed in 1926 to replace one ruined by fire the previous year. They add the state has a fight on its hands in trying to move the high school to Swanton or Wauseon. They’re prideful also of electricity supplied the town by Toledo Edison co. Only one house in Ai is without electricity and that is the house of Bert Shaffer. “I don’t have electricity because I don’t want it,” Mr. Shaffer explains. “I listen to ball games at the store over its radio and when it’s dark I sleep. I don’t need electricity. Mr. Shaffer was 79 a week ago. He’s the town historian. “My Grandparents came here in 1847 and my wife’s grandfather (David Springer) was the first postmaster of the place,” Mr. Shaffer adds. He remembers when Ai was a bustling center of commerce with a grist mill, cider mill, sawmill, two blacksmith shops and wagon factories, drug stores, post office, general store, cheese factory, millinery shop and cobbler’s shop. Not to mention Fulton County’s first undertaker with a hearse. That was better than 70 years ago, though. “We also had four saloons in those days.” Mr. Shaffer recalls. The town’s been dry since the late 1880s when voters decided against the sale of alcohol in Ai. Mr. Shaffer says in those days the residents of Swanton also could vote in Ai. Elections. 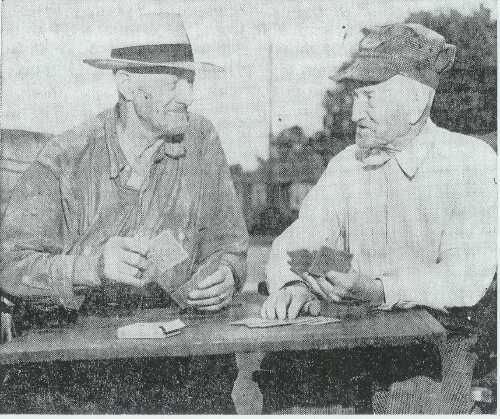 “The Swanton saloon interests packed out polls with their men and we didn’t have a chance,” Mr. Shaffer laments. “Those people in Swanton made sure of getting our saloon business. Ai has never been the same since. A railroad through Swanton almost finished this place commercially. The population has decreased from a high of a few thousand to less than 100. Mrs. Turpening and Mrs. Garsey, try as hard as they might, cannot count more than 90 residents in Ai today. Most of them farm and some of the younger ones commute to Toledo jobs. For the religious, Ai has Union Sunday School for Protestant worship. The few Catholic families here attend church in nearby Assumption. For protection, Ai has Constable Lawrence Martin, whose main enemies of the law are traffic violators. He has plenty of time to farm and drive a dairy truck. For the dead, Ai has a pleasant little cemetery next to Union Sunday School. The tombstones record births and deaths of early Ai residents. One of the oldest stones has engraved on it that Jacob Hamp was born in 1770 and died in 1849. That’s about all there is to the town. It’s a peaceful place where its main street is never too crowded with cars to frighten boys and girls pedaling bicycles to the tune of their dog’s barks. Nothing happened here today but -- It’s probably a good thing too. We started out in Columbus on a simple little quest! All we wanted to know was how to pronounce the name of this little village in Fulton County. “Gosh, I don’t know,” the chief replied. She finally admitted that for something under $8 we could go to Swanton, nearby, & return to Columbus. At Union Station, the railroad men, after much leafing through tariff schedules, admitted they could drop us at Swanton, eight miles to the south, but after that visitors to Ai were on their own. Even the highway, a winding route approaches Ai from the south, makes a horseshoe turn, well above the village and then comes in from the north. We asked to be connected with a resident of Ai. The first wasn’t any notable success. We caught a housewife in some town that sounded like “Smithton” and probably wasn’t. But she didn’t live in Ai for sure. Ai in the 1940 census had 35 residents. The 1950 returns aren’t in. OME: Back to Fulton County Schools Main Page.